The genus Gomphotherium, (gom-fo-theer-e-um) belongs to the family Gomphotheriidae, (a family within the mammal order Proboscidea extinct since the Pleistocene. Gomphotherium is regarded as the ancestor to the genus Stegodon as well as mammoths and both the present living species of elephants. 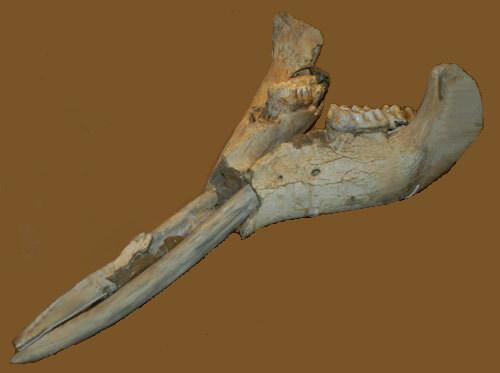 Gomphotherium had both upper and lower incisors (upper tusk bore a prominent, straight enamel band), the skull was elongate and low and they were probably adapted for a life in lakes and swamps where they used their tusks to dig or scrape up the vegetation.